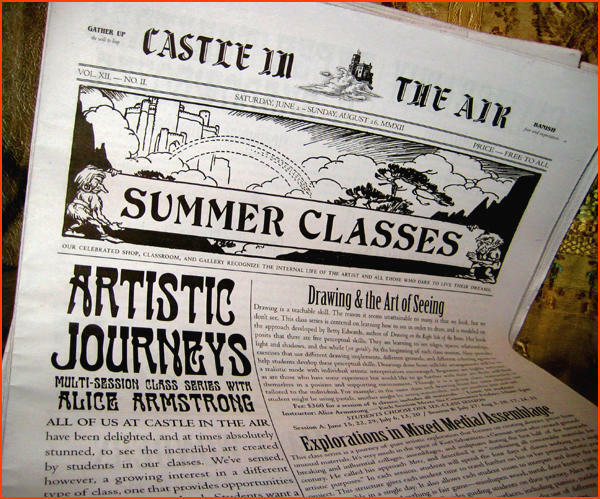 The latest edition of the Castle in the Air class schedule has arrived from the press, so come by the store and get your copy! This issue has listings for classes to be held throughout our summer session, which runs June 2 through August 26. This season we introduce the "Artistic Journeys" series by Alice Armstrong, and Alice's 17" x 22" manifesto poster discussing her Drawing & the Art of Seeing class is included in the center spread of the paper -- suitable for hanging or framing!